If you have an Instant Pot and you have ten minutes, you can make mashed potatoes. I suppose it is also important that you have some potatoes available to work with. Butter is a must. Sea salt is a game changer. 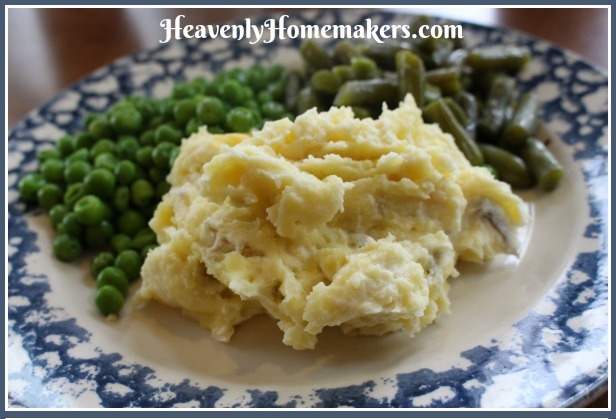 Wait until you see how simple it is to make these mashed potatoes! So I stopped. We never ate mashed potatoes. There simply was no time. I learned to make them in my Instant Pot (my affiliate link). In ten minutes. You know how people always say, “Oh, life was so much better back in the pioneer days. Certainly life was much simpler then.” I agree to a certain extent but alas, the pioneers did not have Instant Pots. So let’s here it for the 21st century and its wonderful technology! So would you believe you can wash potatoes, throw them into your Instant Pot with some water, let them cook for 10 minutes, then mash them and serve them and make everyone very happy? You, of course, will be the happiest of all because you didn’t have to slave over your potatoes. And if your children happen to be of age, you can ask them to scrub your potatoes, making your work load is even lighter! Scrub, but don't peel the potatoes. Put them (whole) into an Instant Pot on the metal trivet, along with 1 cup of water. Seal and cook at hi pressure, manual setting, for 10 minutes. Release the pressure and open the Instant pot. Mash soft potatoes directly in the crock with a potato masher. While mashing, dump in the milk, sour cream, butter, and salt. Continue mashing until potatoes have reached desired consistency. Truly these are the most delicious! Can you use russet potatoes to make these mashed potatoes? I don’t recommend it. They take a longer cooking time, they aren’t as nourishing, and they don’t taste as good. Gold or red potatoes are much preferred! I like to also add shredded cheese to our potatoes to make them tastier and more substantial. Want Simple Meal ideas to serve with your Simple Instant Pot Potatoes? 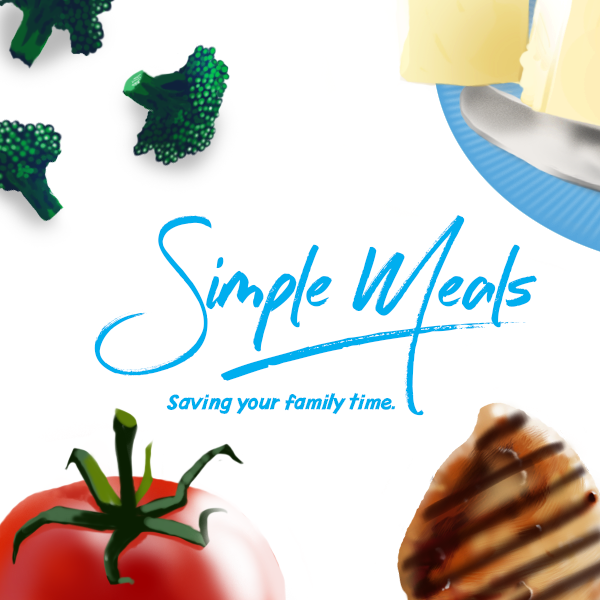 Join Simple Meals. You’ll love it! Because I work from home and we school at home, my daily commute and our trek to school are as far as walking downstairs to the kitchen from our bedrooms (uphill both ways, mind you). This also means that my work attire is typically quite casual and sometimes involves pajama pants. It all makes sense, then, that I would run out the door to a meeting a few evenings ago where I would join many professionals who had just left their offices. They were so dressed up and looked so nice! I took a seat, looked down, and that’s when I noticed that I was still wearing my slippers. Nailed it. But at least I had on actual pants. I’ve gotten to the point of laughing (most of the time) about the craziness of my days – mostly because I truly do love my life – even if it is sometimes questionably insane. The “day of the slippers” I had gone from one kid to the next to the next as we tried to crank out papers and assignments for school, along with a video that was due for a church event the minute we got back from a three day out-of-state basketball tournament. Try as I might, never once was I able to sit down to even answer a work email. The day after that was no different (except that I was still wearing those same slippers). So I’m not sure what came over me when I decided that morning to try the Crock Pot Mashed Potatoes so many of you told me about after I’d lamented that my mashed tater making days had come to an end. They take too much time, said I. They make too much of a mess. I’ve got to keep my meals simple!! All of this is true. After all, I don’t even have time to remember to wear shoes when I go out in public. Therefore no one should expect me to make mashed potatoes for dinner. But since the crock pot version seemed just as simple as making baked potatoes in the crock pot – and I’ve been doing that for years – I decided to give mashed potatoes one last chance. You guys. My children are so happy that you are in my life. They had long since forgotten that mashed potatoes were an actual thing. Imagine their faces (and their full plates) when I presented them with a crock full of beautiful, fluffy, delicious mashed potatoes THAT HAD TAKEN ALL OF 2 MINUTES TO MAKE. The crock pot has made mashed potatoes great again. What’s the difference in the amount of work/time/dirty dishes compared to making mashed potatoes on the stove-top? The difference for me is enormous! When I made potatoes on the stove-top, I’d dirty a pot, and I’d almost always allow the potato water to spill over and dirty the stove-top. Then I’d transfer the cooked potatoes to a bowl and use my beaters to mash them. This means I’d dirty my counter-tops because I’m a messy cook and potatoes would fling precariously from the beaters. I can’t even handle the memory of making mashed potatoes this way. I just had to walk away. 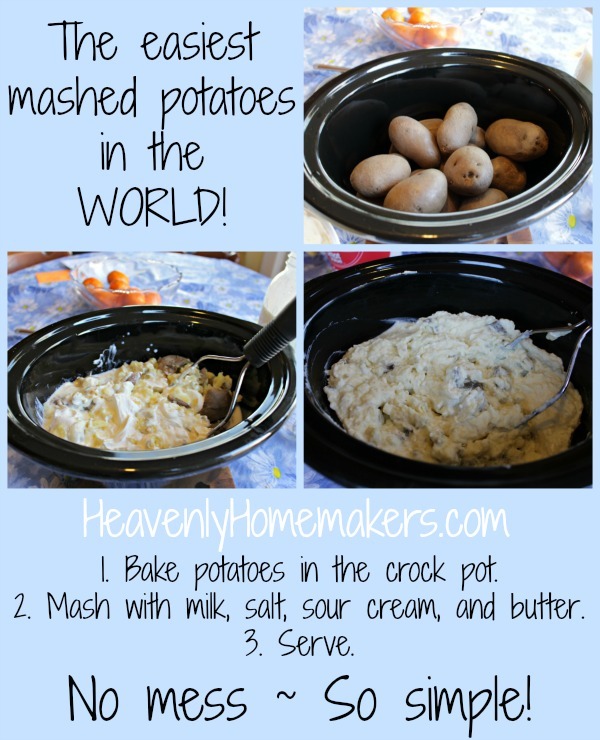 But here’s how to make Simple Mashed Potatoes in the Crock Pot. I do warn you ahead of time and apologize because I no longer know how to cook in small quantity. If you aren’t feeding an army of teenage boys, feel free to cut this recipe in half. Cook them in a crock pot on low for 8-10 hours or on high for 5 hours. You don’t have to add sour cream and butter to these, but if you don’t, what even is the point of eating them?? Much to my family’s delight, I have made mashed potatoes two weeks in a row after a very long mashed potato hiatus. A huge thank you to all who suggested this method! 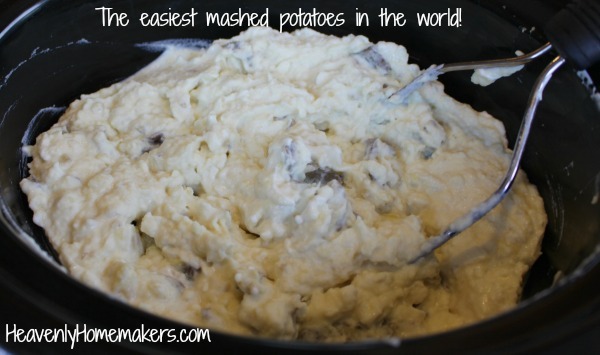 Tell me if you’ve tried mashed potatoes this way? 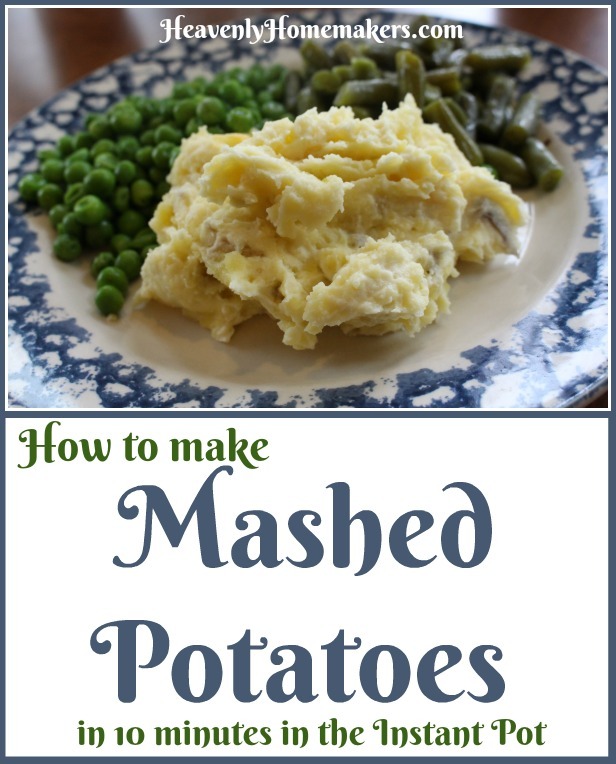 If you haven’t, promise me you’ll join this mashed potato party! It’s funny what people will say on social media. I find it especially humorous when I say a brief statement, link to a post, then people react to my words without clicking over to actually read the post. My intent with this Facebook post was to share some ways to cut back on our time in the kitchen. 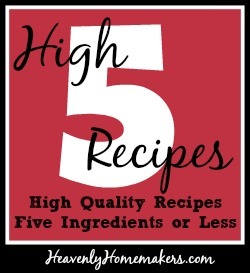 To share some easy recipes to make kitchen life easier for busy families. Everyone wants to hear about this, right? Lazy. Yes, that’s definitely it. For the record, I didn’t actually feel attacked about my mashed potatoes. The comments were barely negative and most people shared nice comments. People like to share their opinions, and sure, sometimes their words can seem to come out a little harshly. I’ve grown a thicker skin through the years. Sticks and stones may break my bones, but mashed potatoes? Naw. 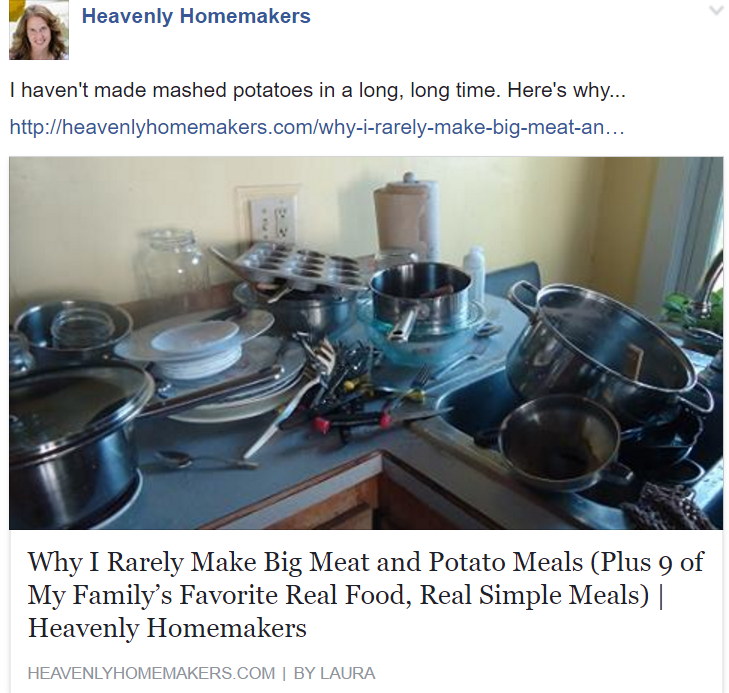 One thing I learned is this: Some people truly don’t find it difficult to make mashed potatoes regularly. I think this is fantastic. Bring on the gravy. As for me? The thought of making mashed potatoes often, during this season in my life, truly does cause me stress. Through the years, I’ve pared back and pared back and pared back on my kitchen duties. My family eats more food than ever, and at the same time, I have less time than ever to devote to cooking and cleaning. I’ll save the mashed potatoes for Thanksgiving. 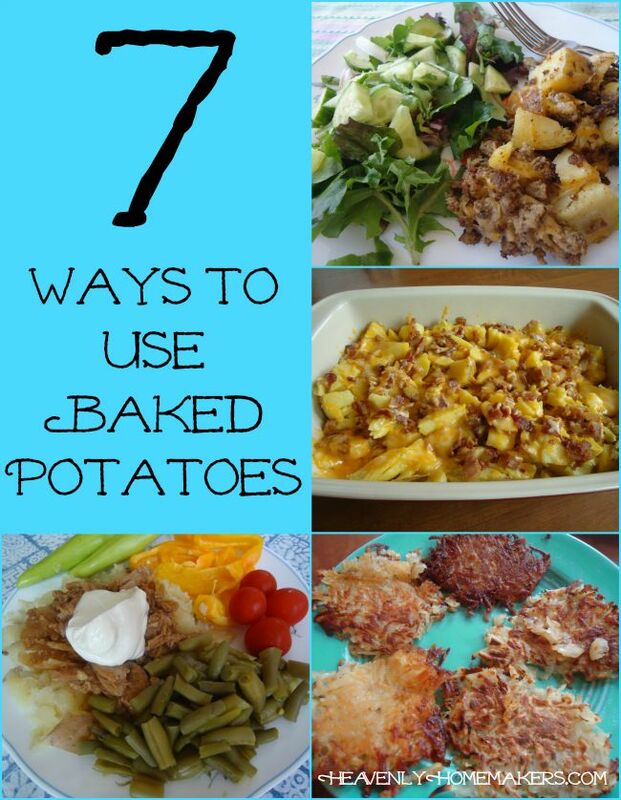 I’ll stick with baking potatoes because they are easier and less messy and more versatile. How about you? Have you given up on mashed potatoes like I have, or are you a mashed potato champion? I do almost all of the cooking around here…not because Matt can’t or won’t cook. I just really, really love to cook and have more time to be in our kitchen. However, ever since Matt started working at a restaurant, he’s been quite a bit more interested in learning about food preparation – and guess what? My husband has a really great cooking tip for you today. 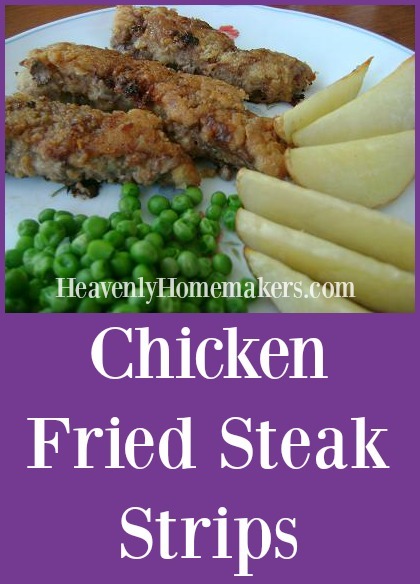 It will make an extra yummy, extra crispy coating on the outside of the strip. My strips were good, but I had just been single dipping. Following Matt’s advice, I am now double and even triple dipping. Now, they are Oh My Goodness Amazing. All thanks to my husband. I love that man. You will too after you try his double/triple dipping advice. But you can’t have him. He’s mine. Cut cube steak into 1 inch strips. In a bowl, stir together flour and garlic powder. Pour milk into a separate bowl. Heat oil in a skillet (350° for electric skillet or medium heat on the stove top). Dip beef strip in milk, then in flour mixture. So let’s review: The more you dip, the better the strip. You’ve gotta try it! 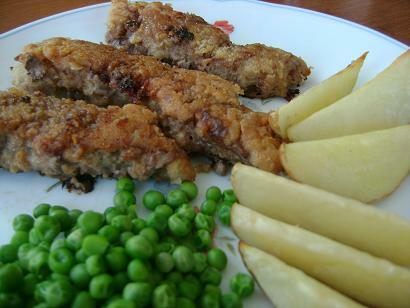 Read a great tip about Preparing Ahead and Flash Freezing your Chicken Fried Steak Strips here!